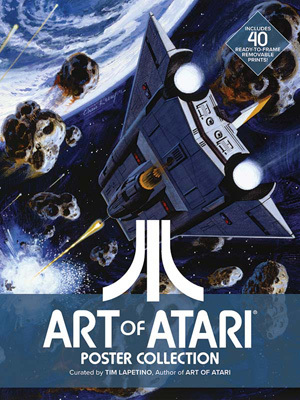 The artwork of Atari inspired a generation and created a bridge from the simple on-screen graphics of its early games to the imaginations of eager gamers. Now, DYNAMITE ENTERTAINMENT proudly brings the most iconic, mind-blowing video game illustrations to posters, each one easy to remove and perfect for display, showcasing the tremendous talent of Atari's greatest artists! Millipede 2600, Star Raiders 520, RealSports Baseball 5200, Missile Command 2600, Centipede 2600, 3D Tic-Tac-Toe Asteroids 2600, Basketball 2600, Asteroids 5200, Centipede 5200, Asteroids 7800, Combat Two, Demons To Diamonds, Crystal Castles, Football 2600, Haunted House, Haunted House (Unused), Home Run, Missile Command 5200, SwordQuest Fireworld, RealSports Tennis, RealSports Baseball, Surround, RealSports Basketball 2600, Video Checkers, RealSports Soccer 5200, RealSports Volleybal, SwordQuest Airworld, AtariAge SwordQuest Cover, Video Pinball, SwordQuest Waterworld, RealSports Basketball 5200, RealSports Football 2600, Star Raiders 2600off, Super Breakout 2600, Tempest 2600, Warlords, Yars' Revenge, Warlords Family, and the Atari Wizard!